The Pollnivneach Slayer Dungeon, located in the center of Pollnivneach, is a great place for higher leveled players working on slayer to complete their tasks. It is home to a Banshee Mistress (134) and an Insectoid Assassin (141) during the Smoking Kills Quest. 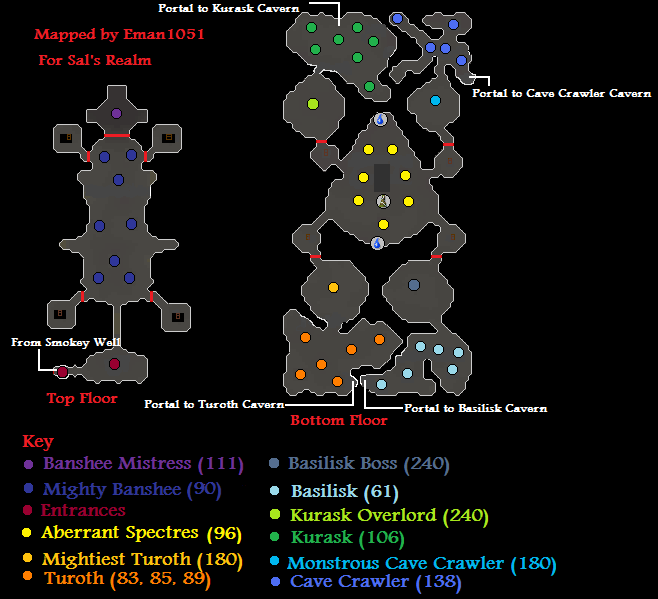 After the quest is complete a Monstrous Cave Crawler (138), a Basilisk Boss (138), the Mightiest Turoth (138), and the Kurask Overlord (138) can all be found in this smokey, scary, scream filled dungeon. The entrance of the dungeon is located underneath the well of Pollnivneach, there are many ways to get there. 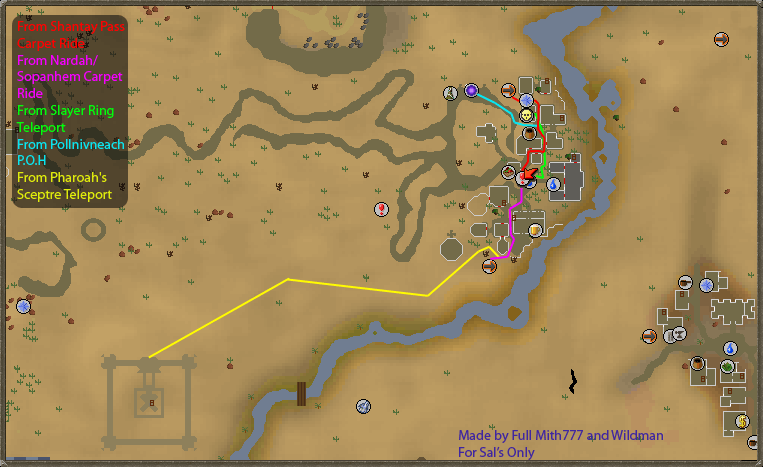 One way to get there is go to the Shantay Pass located south of Al Kharid, once there buy a Shantay Pass from Shantay and go through the pass. After you go through the pass, buy a flying carpet ride to Pollnivneach, and head to the middle of the city and climb down the well. Another way to get there is if you're in Sophanem you can take a flying carpet to Pollnivneach, and head to the middle of the city and climb down the well. If your house is in Pollnivneach you can use the teleport to house spell, and run to the well and climb down. If you own a Ring of Slaying you can use it to teleport to Sumona, and head down the well in the middle of the city. If you have a Pharaoh's Sceptre you can teleport to the Desert Treasure Pyramid and run to Pollnivneach from there and go down the well. Once you have made it to the center of Pollnivneach, there is a well. Climb down it and you will appear in the Desert Slayer Dungeon. If you just want to speak to Catolax, you only need a Facemask to survive, but if you intend to progress, you will need Masked Earmuffs or a Slayer Helmet to survive against the Mighty Banshees. Once you enter the well you will be in a room with Catolax, who was a major character in the Smoking Kills Quest. If you talk to him with the Amulet of Ghost Speak he will give you information about who Sumona really is. 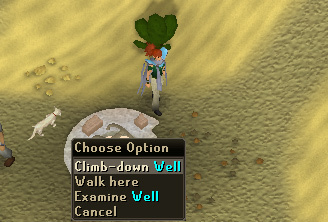 If you head west you will be at the entrance to the Smokey Well used in the Desert Treasure Quest. If you go north of Catolax you will be in a room filled with level 130 Mighty Banshees. They are aggressive and if you're not wearing Masked Earmuffs you will be attacked and your stats will drop dramatically. If you keep heading all the way north you will be at the entrance to the Banshee Mistress's Room. She is level 134 and is killed to complete Smoking Kills. After exploring the first floor of the dungeon, head down any of the four staircases, two on either side of the Mighty Banshees room and you will find the rest of this dungeon's inhabitants. Heading to the center of the dungeon you will find a room full of level 112 non aggressive Aberrant Spectres. In order to fight the Aberrant Spectres you must have a Slayer Helmet equipped because you need a Facemask to survive in the dungeon and a Nose Peg to fight them. 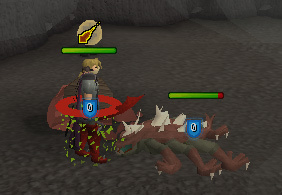 The only way to get this combination of slayer gear is to be wearing a Slayer Helmet. 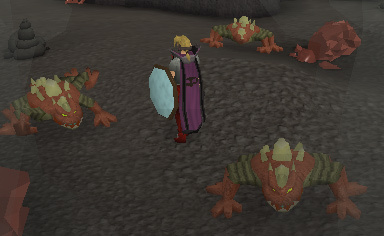 If you are successful in defeating the Kurask Overlord or any of the other bosses in the dungeon you are then able to pass through their portal and fight their smaller counterparts for slayer tasks. 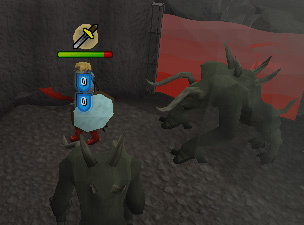 After successfully defeating each monster you are rewarded with 1,000 slayer experience for a total of 4,000 slayer experience. 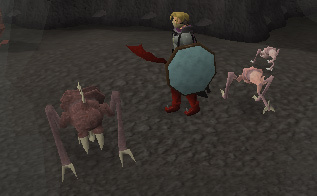 If one of the monsters was your assigned slayer task at the time you can get an additional 960 slayer experience, for a total of 4,960. 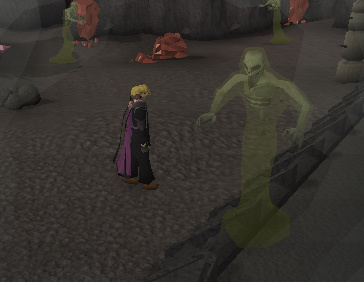 Northwest of the Aberrant Spectres you will find a mystic portal and behind it, the level 138 Kurask Overlord. This creature and its minions can only be defeated if you have a Leaf-Bladed Spear, a Leaf-Bladed Sword, Broad Arrows, Broad-tipped bolts, or are using the Magic Dart Spell. Heading to the Northeast of the dungeon you will find the level 138 Monstrous Cave Crawler. This extremely poisonous enemy can not only poison you, but also decrease your stats with its corrosive poison! It will poison you every 5 seconds with Super Anti Poison. To the Southeast of the dungeon is the level 240 Basilisk Boss. Make sure you bring your Mirror Shield and a few Super Restore Potions before attempting to fight him though; his strange magical attacks will drastically decrease your levels while in combat. 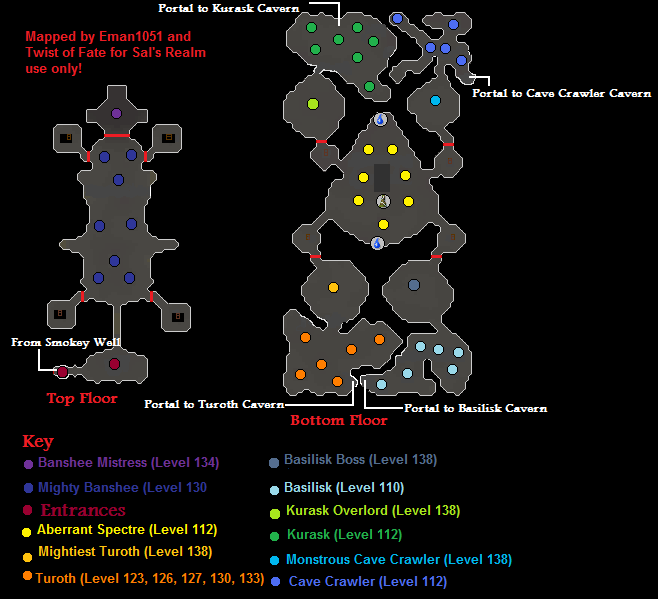 Finally to the Southwest of the dungeon you will find the level 138 Mightiest Turoth. This creature and its minions can only be defeated if you have a Leaf-Bladed Spear, a Leaf-Bladed Sword, Broad Arrows, Broad-tipped bolts, or are using the Magic Dart Spell. Once you have defeated any of the bosses you'll be teleported back to the portal entrance, and get the ability to go through any of the portals without battling the bosses anymore. Now that you can go through to portals whenever you want without the bosses, you can kill Kurasks, Cave Crawlers, Basilisks, and Turoths in each room where the boss was defeated. Kurasks are located in the northwest section of the bottom level. They're level 112 and need level 70 Slayer with a Leaf-Bladed Sword, Leaf-Bladed Spear, Broad Arrows, Broad-tipped bolts, or the use of the Magic Dart Spell to kill them. They're aggressive and use melee attacks. In the southwest section of the dungeon is the barrier to Turoths. They require at least level 55 Slayer and either a Leaf-Bladed Sword, Leaf-Bladed Spear, Broad Arrows, Broad-tipped bolts, or the use of the Magic Dart Spell to kill them. Their levels are either 123, 126, 127, 130, 133 and are not aggressive. 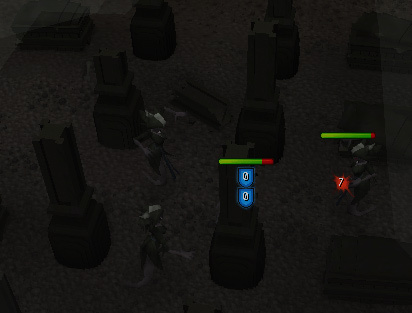 They attack with melee attacks. In the southeast section there are Basilisks. They require level 40 Slayer and a Mirror Shield to defeat or their attacks will drain your stats. They are level 110 and not aggressive. They attack using melee except if you don't have a Mirror Shield then they will attack with magic. Finally in the northeast section there are Cave Crawlers. 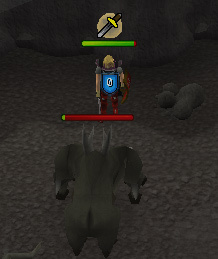 They require level 10 Slayer, and are different than other Cave Crawlers. 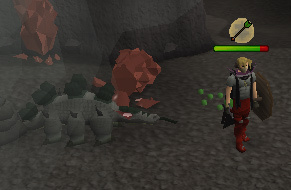 These Cave Crawlers are level 112, and give more Slayer experience than other Cave Crawlers. They don't require anything, but they are very poisonous so Anti Poison is highly recommended. These unlike their boss attack with melee. 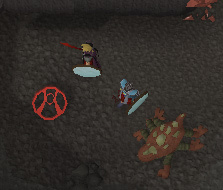 In every part of the cave where a different slayer monster is there's a portal leading to their others in the Fremennik Slayer Dungeon. For example in the Basilisk part of the dungeon in the most southern part of its cave are red pulse markings on the ground. 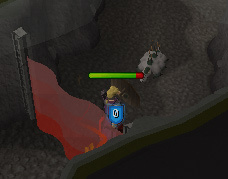 If you click 'Enter Pulse Markings' you will arrive in the Basilisk section of the Fremennik Slayer Dungeon. 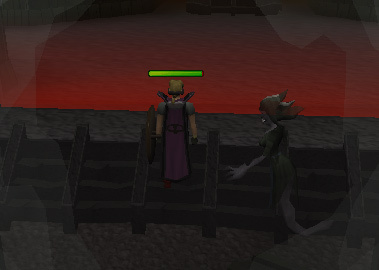 Be warned once you enter there is no way back from the Fremennik Slayer Dungeon.